I fear my Decepticon Counterpart is nearby. Really nearby. As the explosions roar and laser bursts slam into armor plating, Punch remains cool and aloof. It's a characteristic that his fellow Autobots envy during this time of war. However, buried in his processors deep below this false aura of composure, lurks a rampant paranoia with which the Autobot spy is in constant conflict. Recently this paranoia has become so intense that when in infiltration mode, Punch has started to black out due to immense fear. When he reboots he finds that he has no recollection of how he has completed the mission, but is always thankful that his Counterpunch persona has seemingly pursued the objective on its own. Robot Modes: Unsurprisingly the double spy Punch has two robot modes, one portraying his Autobot persona, the other his Decepticon cover identity Counterpunch. In the former he uses the hood of the car mode as a chest (think Sideswipe), which makes him seem very broad and strong. The mostly blue paintjob is broken up with orange highlights on the chest, hip and shoulders, as well as the head. The downside here is that the screws are visible on the hip and thighs in this mode. Also, the legs are sideways from their standard configuration, leaving no real room for the feet to extend forward. Punch can still stand without problems, but it takes some doing to get him there. As Counterpunch the figure uses the Sunstreaker-configuration, meaning the car’s roof is now the chest while the hood forms the back. The hip is also reversed, now showing red highlights (and now screws). Same goes for the shoulders. The downside here is, of course, that the fists are wrong now, with the thumbs on the wrong side. The only way to get them right is to swap the fists, which is possible but not exactly easy. I would have preferred new, double-thumbed fists for this figure, truth be told. All in all Counterpunch looks a lot darker than Punch (as befits a Decepticon) and doesn’t really resemble him much. Unless, of course, you look at him backwards. The figure has a two-sided head, with one side featuring Punch’s face and the other Counterpunch’s noggin’. This is actually a near-perfect copy of the first Punch/Counterpunch head, featuring the same kind of slip-down helmet that can cover either side of the head to hide one face. Unlike the G1 version, this figure only comes with one weapon, but this is fixed by turning it around. Punch uses the shorter, double-barreled end (really the car’s tail pipes), while Counterpunch fires with one long barrel. Not perfect, but okay. According to the profile picture the weapon should be enhanced with the supercharger intakes (the thing on the car roof) in both configurations, but personally I find it better to just use it for Punch and leave it on Counterpunch’s back as a jetpack. But to each his own here. All in all it’s not a perfect mesh of two different robot modes in one figure (Animated Shockwave does it a tad better in my opinion), but it’s a very nice homage to the original Double Spy and makes good use of this very solid mold. So thumbs up here. Vehicle Mode: Both Punch and Counterpunch share a single vehicle mode. Now it’s hard work to make a Lamborghini-type car look inconspicuous, but the blue chassis and black-tinted windows manage it quite nicely. It’s not as plain-looking as the vehicle mode of the original Punch / Counterpunch figure, but this new guy seems more the James Bond type, so he travels in style. The license plate on the back reads “P CNTR P”, which is, of course, short for Punch / Counterpunch. Not much more I can say here. Oh, interesting detail: The headlights of the car were painted blue like the rest of the car instead of leaving them transparent as they were on Sideswipe and Sunstreaker. Strangely enough, this makes the car more G1-accurate. All in all, a good, if somewhat boring vehicle mode. Remarks: When this mold first came out in the form of Universe Sunstreaker, many fans immediately recognized the potential for a Punch / Counterpunch figure in it. The first custom jobs weren’t long in the waiting, either. The mold was a natural for this character with its ability to use either hood or roof of the car mode as a chest. 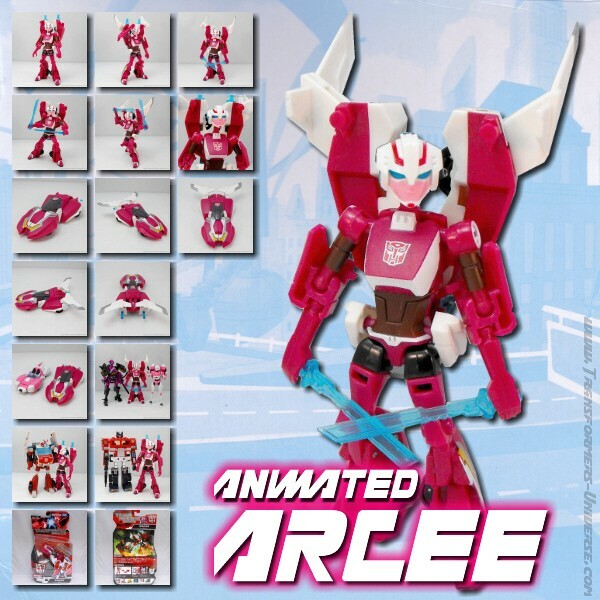 So it wasn’t much of a surprise when the Transformers Club announced its new exclusive figure. For the first time since 1987 we have a new Punch / Counterpunch, possibly the most interesting Transformers character that was never really used in any media. The figure’s profile text hints at the same multiple personality disorder that was described in Punch’s Dreamwave profile, which would be a very interesting take on the character. Maybe the Transformers Club comic book will finally explore this character now, more than 20 years after his initial appearance. As far as the figure goes: A very nice use of the mold, a very nice homage to the original. Whether or not you’re willing to dish out the necessary cash to get this club-exclusive figure is, of course, entirely up to you. Speaking for myself, it was worth it.